Complete your first online race (any discipline). Complete 25 races online (any discipline). Win a normal Flat Track race. Win a Monza Masters' Show. Win a Special Stage of the Monza Rally Show. Win an "Americana" Flat Track Race. Win a Yamaha R1M race. Beat a track record on any track with a 2016 MotoGP™. Hold a wheelie for 8 consecutive seconds. Sign the contract to race your first season as an official rider. Reach the maximum level in one of your rider’s abilities. Reach the maximum level in all of your rider’s abilities. Win a MotoGP™, Moto2™ or Moto3™ race using Guided Settings. Win a MotoGP™ race with PRO physics, tire wear and damages activated. Complete the 1996 VR|46 Historic Event. Complete the 1998 VR|46 Historic Event. Complete the 2001 VR|46 Historic Event. Complete the 2002 VR|46 Historic Event. Complete the 2003 VR|46 Historic Event. Complete the 2005 VR|46 Historic Event. 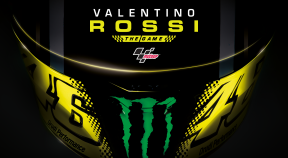 Complete the 2008 VR|46 Historic Event. Complete all VR|46 Historic Events. Complete all Challenge "The Doctor" events. Complete a race at the Red Bull Ring - Spielberg in Career mode. Become world champion in Career mode (any category). Participate at the EnduRanch Flat Track in Career mode. Race a total of 155 miles with a Flat Track bike. Race a total of 155 miles with a Rally car. Race a total of 311 miles on a MotoGP™, Moto2™ or Moto3™ bike.